A special dividend, also referred to as an extra dividend, is a non-recurring “one-time” dividend distributed by the company to its shareholders. it is separate from the regular cycle of dividends and is abnormally larger than a company’s typical dividend payment. Special dividends are typically declared after exceptionally strong company earnings, the sale of a subsidiary or business unit, a business spin-offSpin-OffA corporate spin-off is an operational strategy used by a company to create a new business subsidiary from its parent company. A spin-off occurs when a parent corporation separates part of its business into a second publicly-traded entity and distributes shares of the new entity to its current shareholders., or for achieving a company milestone. When there is too much cash available on a company’s balance sheetBalance SheetThe balance sheet is one of the three fundamental financial statements. These statements are key to both financial modeling and accounting. The balance sheet displays the company’s total assets, and how these assets are financed, through either debt or equity. Assets = Liabilities + Equity and it does not decide to reinvest the cash back into the business, the company may choose to distribute the cash in the form of a special dividend. A prominent example is Microsoft’s special one-time dividend of $3 a share in July 2004, valued at a total payout worth $32 billion. Recall the accounting equation Assets = Liabilities + Shareholders Equity. A special dividend can be used to alter a company’s capital structureCapital StructureCapital Structure refers to the amount of debt and/or equity employed by a firm to fund its operations and finance its assets. The structure is typically expressed as a debt-to-equity or debt-to-capital ratio. Debt and equity capital are used to fund a business’ operations, capital expenditures, acquisitions, by reducing equity and assets. By paying a special dividend, the company is altering the percentage of debt vs. the percentage of equity used to finance the company. 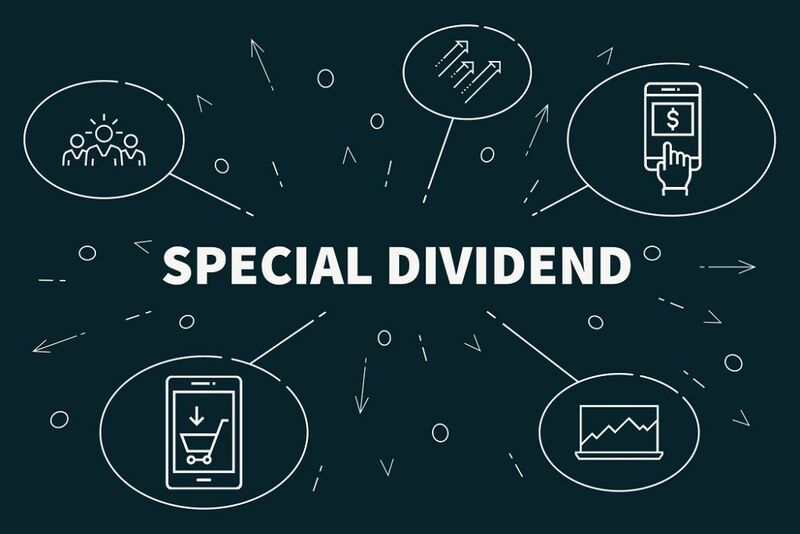 Special dividends can be used by a company to show confidence in its long-term value generation and improve shareholder confidence. When shareholders receive extra cash in the form of a special dividend, they are more likely to stick with the company in the long term. Companies may use a special dividend in conjunction with their regular dividend policy to form a hybrid dividend policy. It can be seen with cyclical companies where they are largely affected by the economic outlook. Cyclical companies may follow a normal dividend cycle and also declare a special dividend when the company is performing better than normal. It is better than increasing the dividend rate during economic booms or decreasing the rate during economic recessions, which may send mixed signals to investors. A special dividend can be seen by investors as the company finding no better use for its cash reserves. In other words, investors may see the company facing a lack of reinvestment opportunities. It may have a negative impact on the company’s stock price as investors may believe its growth potential is decreasing. Companies may declare a special dividend only to realize that they do not have enough cash to fund future projects. Therefore, the opportunity costOpportunity CostOpportunity cost is one of the key concepts in the study of economics and is prevalent throughout various decision-making processes. Opportunity is the of declaring a special dividend is high. For example, consider a company that distributes its cash as a special dividend to investors. If an attractive investment opportunity were to arise in the future, the company might not have enough cash on its balance sheet to fund the project. Special dividends exert the same effect as a cash dividend on share prices. For example, consider a stock that is currently trading at $100 one day before the ex-dividend dateEx-Dividend DateThe ex-dividend date is an investment term that determines which stockholders are eligible to receive declared dividends. When a company announces a dividend, the board of directors set a record date when only shareholders recorded on the company’s books as of that date are entitled to receive the dividends.. The special dividend declared is $20 per share. Theoretically, on the ex-dividend date, the stock should decrease by $20 and trade at $80. With that said, the stock might be higher or lower than $80 on the ex-dividend date, depending on investor sentiment regarding the special dividend. The journal entries for a special dividend are the same as a cash dividend. Consider a company that declares, on January 1, a special dividend of $1 per share on the 5,000 shares currently outstanding. The dividends are payable on February 1 to shareholders of record as of January 15.